The initiative to create a new music library for Palestine was launched by the Vienna based music agency K und K Wien at the end of 2014. Petra Klose, the founder of the agency and her team developed a new music project for Al Quds University operating within a network of Palestinian and international music institutions and offering talented students from all backgrounds the chance to develop their knowledge, skills, understanding and artistic expression to help them to contribute to musical life in Palestine and abroad. Through the years the commitment of renowned artists from France, Austria, Germany, the Czech Republic, Canada, Australia, Switzerland, Germany, Finland, Poland, Hungary, the U.K., U.S.A., Belgium, Morocco, the Netherlands and Slovenia led to spectacular results, one of the most incredible developments has now come to bloom - the establishment of a new Palestinian Music Library. This library is the impressive result of joint efforts of the dynamic international music community and the unlimited possibilities of today’s social media. Music manager Petra Klose sent an e-mail to friends and colleagues in Europe and the U.S.A. asking if they would be willing to send spare music material or instruments to Palestine. A few days later she found her e-mail shared via Facebook, Twitter as well as by several prominent music platforms on the internet. As a result, artists from all corners of the world sent their music scores, CDs and instruments. Important music institutions donated whole sections of their own libraries. 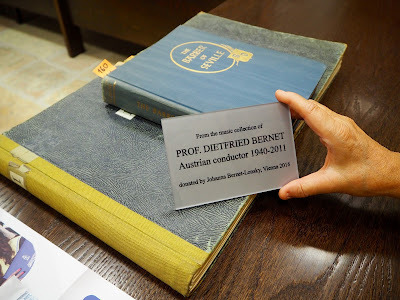 Among the many contributions is the highly precious heritage of the famous Austrian conductor Dietfried Bernet. Maestro Bernet was admired at opera houses and concert halls across Europe and worked with orchestras such as the London Philharmonic, Orchestre National Paris, Vienna Symphonic Orchestra, Vienna Philharmonic Orchestra, RAI Rome, Berlin Philharmonics and the Chicago Symphony Orchestra. The new library includes specialized literature, scores, partitions, orchestra material and recordings. It therefore offers a musical infrastructure which is very much needed in the region and which represents a milestone in the development of a versatile and professional Palestinian music scene. At the same time it is a positive symbol for the power of music and a beautiful example of what is possible through the support of united artists around the world. The material was sent to the Austrian Cultural Forum in Tel Aviv through diplomatic courier and was then registered at the Austrian Hospice in the Old City of Jerusalem. 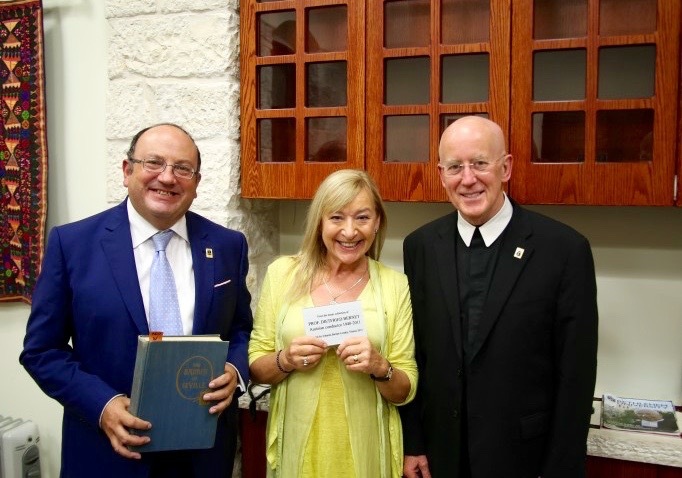 The main part of the immense music collection now found its new home at Bethlehem University where it is currently installed by the head of the library, Dr. Mellie Brodeth and her team. Another part will be situated in the very heart of Jerusalem’s Old City, in the public library of Al Quds University. Both institutions will open their doors to all professional musicians and students of the region in order from ow on have access to these music treasures. “In people’s lives, there needs to be an experience of beauty, a beautiful campus, beautiful library, beautiful ambiance, even beautiful music.” said Brother Peter Bray, Vice Chancellor of Bethlehem University who expressed his thanks to all donators as this new library iful ambiance, even beautiful music.” said Brother Peter Bray, Vice Chancellor of Bethlehem University who expressed his thanks to all donators as this new library symbolizes hope for his students. The Austrian conductor Dietfried Bernet was born in Vienna in 1940 in the middle of World War II. His musical talent was discovered already in his early childhood and although being born into a poor working class family he managed even as a young boy to earn money - with tutoring lessons for younger pupils or selling for some pennies the tiny textile waste of his mother, who was working as a seemstress. Thus he could afford second and third hand music sheets, music publications and small music scores. A part of this initial musical collection has survived throughout at least 18 removals throughout 50 years and one can find this amongst the Dietfried Bernet legacy which has now arrived in Bethlehem. „Bethlehem University is honored and delighted to house this prestigious collection especially when some of it belonged to Maestro Dietfried Bernet.“ said Michael Shibly Sansur, Executive Vice President of the university. 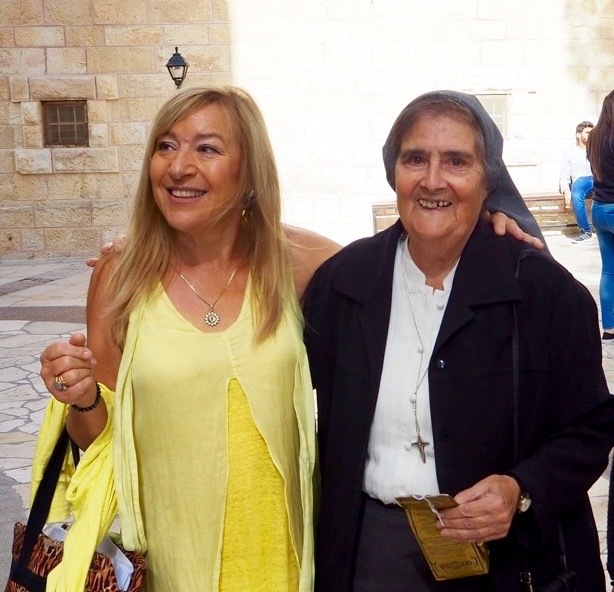 During her visit to Bethlehem University, Johanna Lonsky enjoyed a lively encounter with the music students of Bethlehem University. Encouraged by their professor, Sister Patricia Crockford, some of them gave a spontaneous performance on the piano or expressed their feelings and experiences of becoming an artist, discussing their joys, fears and dreams for the future. At the end of her inauguration speech Johanna Lonsky encouraged the students to continuously take a stand for their talent as „it is the arts that gives people hope, that nourishes, that makes it posssible to endure anything. The arts make people sense, who we really are in the depth of our being.